Books | Sheryl Kaleo... var scss_share_image="https://www.sherylkaleo.com/wp-content/uploads/2015/11/Sheryl-Kaleo-Banner-copy-copy.jpg"
I’m currently working on two books, both set in SolarPunk worlds. I wrote my first Solarpunk novel in 2004 about a girl who traveled from our century to a future world that was seemingly perfect. That book was called TimeWalkers and it won the Colorado RWA Heart of the Rockies in 2006. I then wrote a few urban fantasies and sci-fi novels, but ever since TimeWalkers, I’ve focused on writing in this genre. 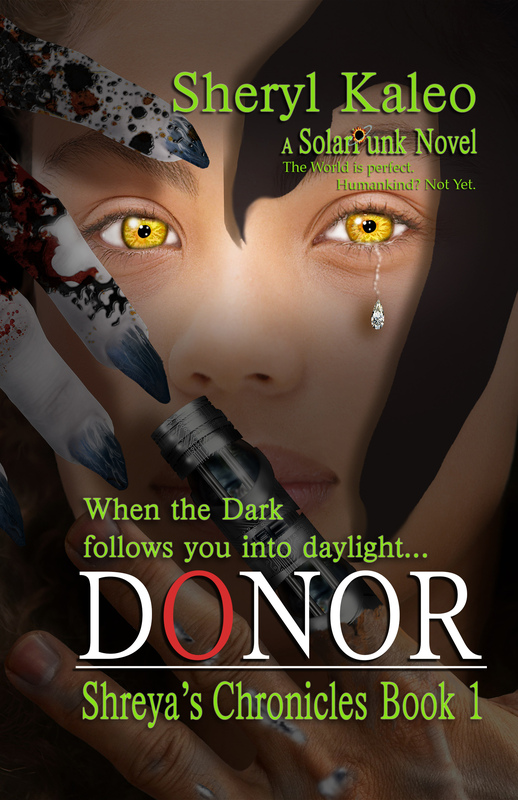 DONOR (Shreya’s Chronicles Book 1) is a fantasy sci-fi novel set in a SolarPunk world. DONOR won the Southern Magic Romance Writers Linda Howard Award of Excellence in 2011. For DONOR Excerpts please go here. Shreya’s plans for life after high school means a local college and settling down with a nice local boy in a house with a white picket fence and a two-hovic garage. She’s a homebody. But life has different plans for Shreya and is about to teach her that leaving home is never a choice when everything she’s ever believed about her identity is a lie. Shreya is about to become a fugitive on the run from the law, the unlawful, and those beyond any natural laws known to Humankind. To purchase these and other books by Sheryl Kaleo, please visit Sheryl’s Amazon Author, Kobo,and Barnes & Noble pages. Editing Process: DONOR went through several rounds of editing, first by my writing group, then my critique partners, then by a freelance editor, all of whom look at structure and concept. Then my stories are line-edited by a second round of critique partners before they’re line-edited professionally by a freelance editor. Then they’re read by beta readers. My images are critiqued, then included in the final copy. After all of this, my books are professionally formatted. Apologies. Until recently, I used to post excerpts of my upcoming stories here on my blog and on my other social media sites. But due to piracy issues, I had to remove them all. Things are changing fast on the internet and vendors are getting smarter at helping writers retain rights to their works. So hopefully this issue will be resolved soon.